Last year I took a photography class from Franklin Habit which helped me immensely. 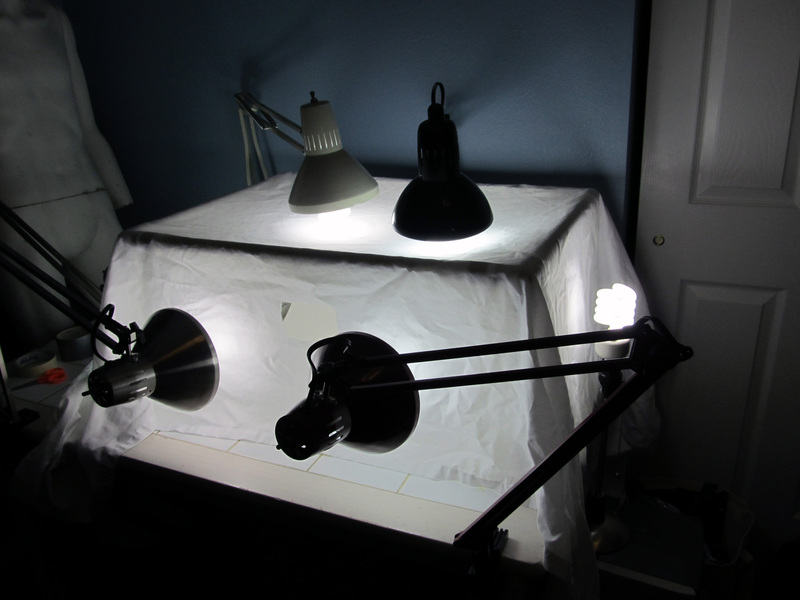 One of the things he covered in class was how to make (and use) a light box. As someone who lives in a perpetually overcast area, is surrounded by light-blocking trees, and who is frequently asleep during daylight hours anyway, you can imagine how thrilled I was to add this to my skill set! 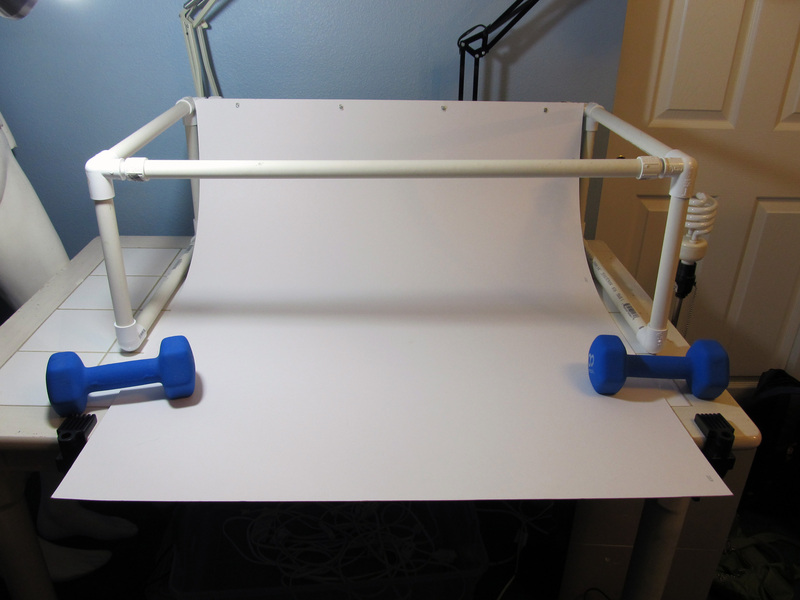 You can buy one of course, but it’s much cheaper to make one yourself (and really it won’t make a difference to the finished photo if you shelled out big bucks for a “professional” light box). I took some tips from Franklin and some from the internet, and have come up with a great light box of my own! 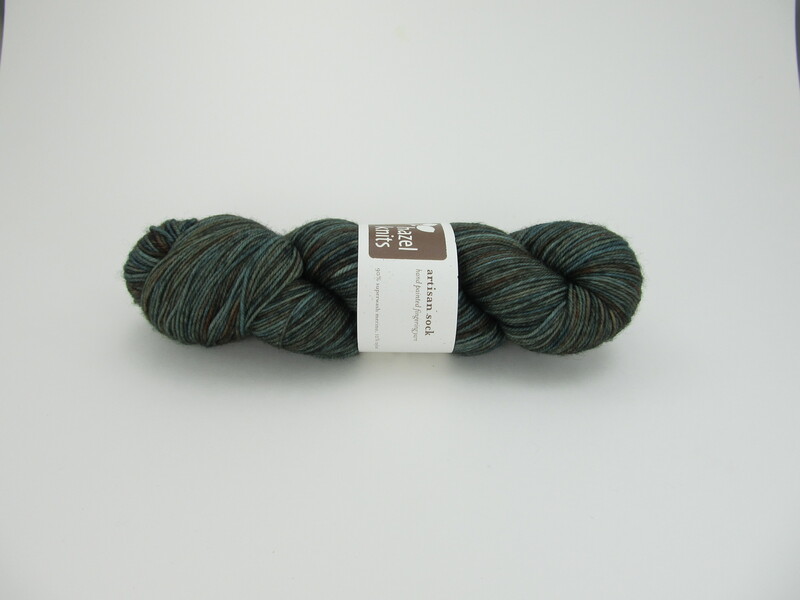 I have some longer lengths cut for project photography and smaller lengths for mini skein and very small project photography. To connect the frame together I had to improvise a bit. I could not find any three-way joints that had all three openings the same size. One of the three-way joints I found had screw threads on the smaller opening, so I found an adapter in the right size that would screw in to the smaller opening. 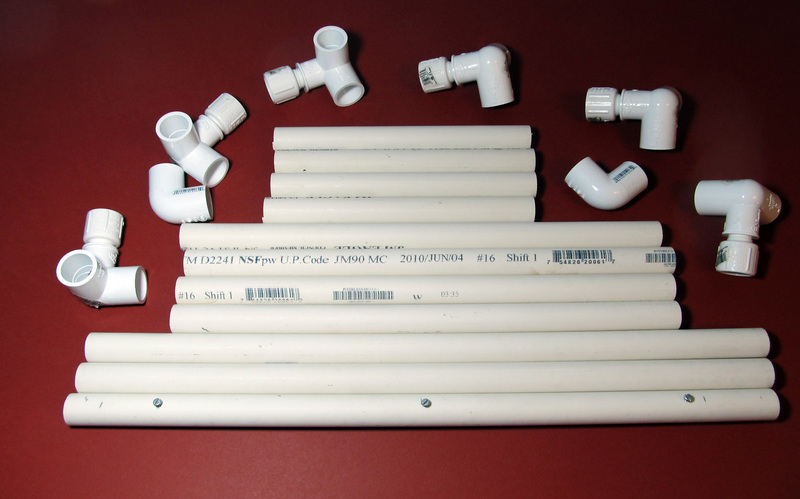 I needed 6 three-way joints and 6 adapters. For the bottom front of the box there will be one length missing, so I needed two elbow joints too (much easier to find). 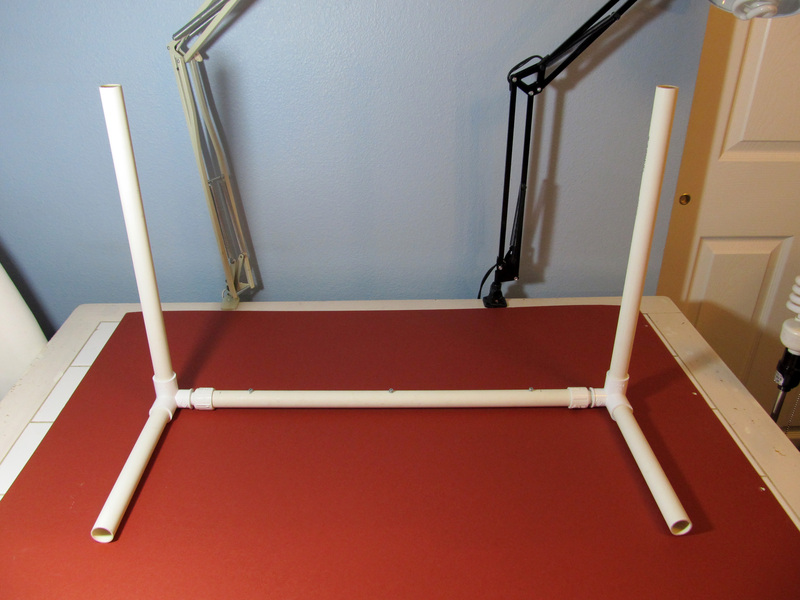 One of the lengths of PVC pipe is used to hang the background. 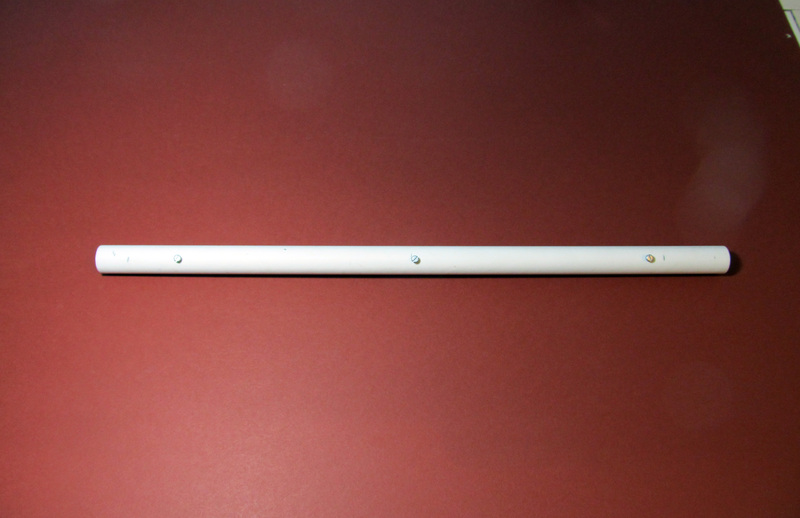 For my standard size box it is one of the 23″ pipes. On this pipe I had my dad put in three screws. 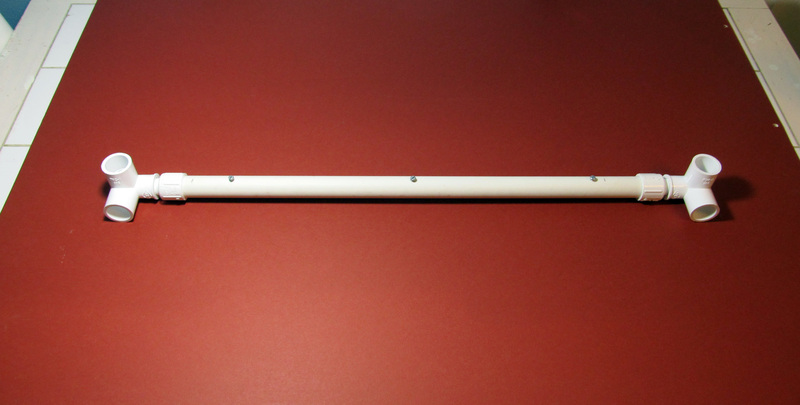 I think they were just wood screws, nothing special, just make sure they’re not too long for the pipe. 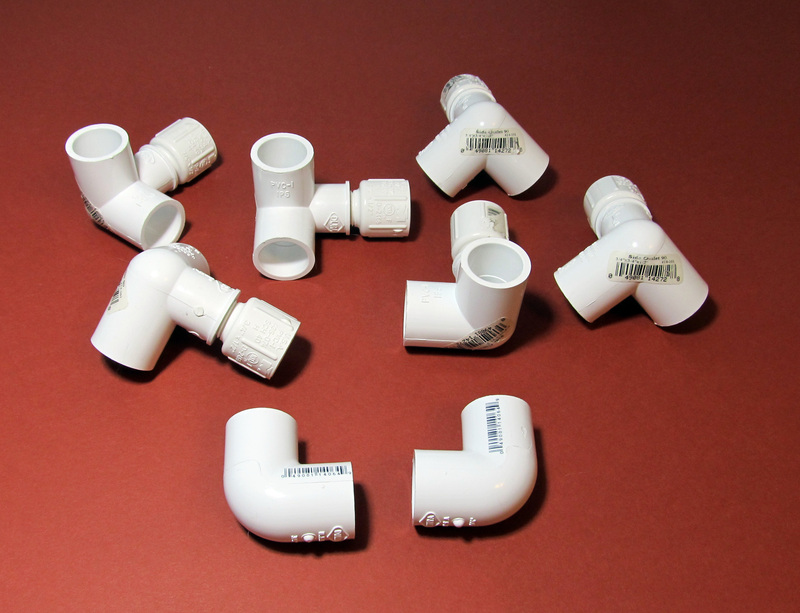 You don’t want the screws to go through both ends of the pipe, you want the pointy end to stay inside, but you also don’t need the heads of the screws sticking out too far. I think the screws he used were only 1/2″ long. The heads of the screws should be about the same size as the hole your paper-hole puncher would make. 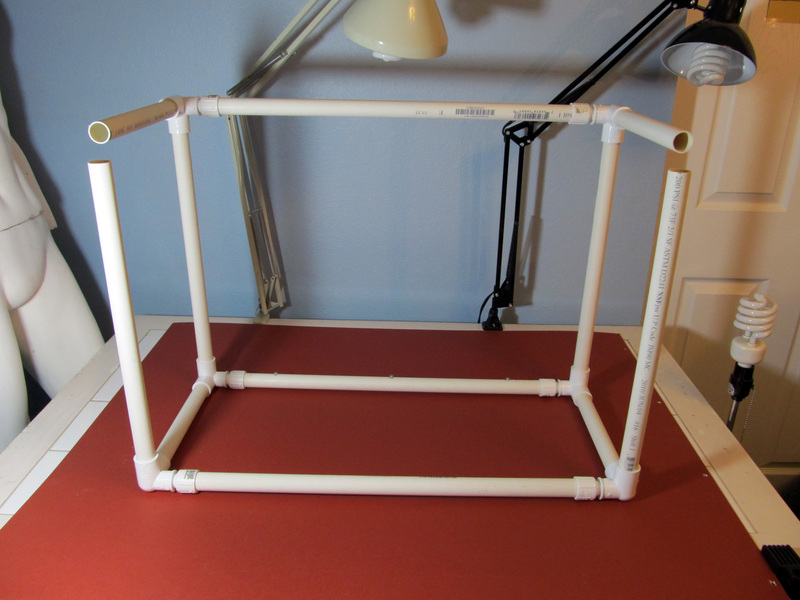 To assemble the frame, I connect the adapter side of the joints to the pipe that will hang the background and build out from there. 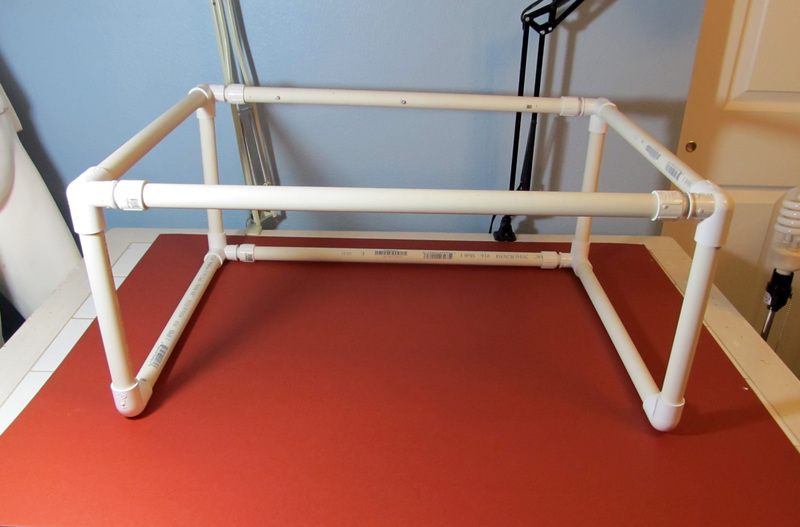 For the background I got some white poster board (standard size is 22″x28″) from Fred Meyer. I grabbed a few other colors for good measure, but mostly I just use white. The thickness can vary and I’ve used both. 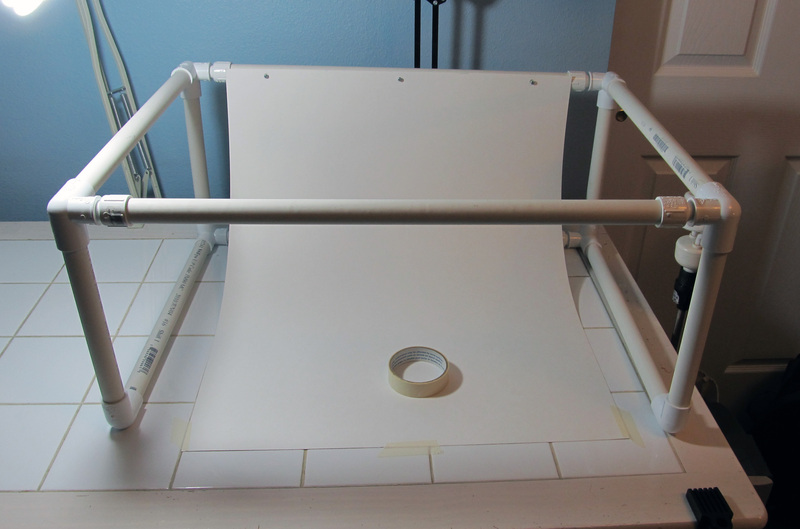 The thicker poster board takes a bit more work to keep it bent for photography – I usually have to tape the front end down. The thinner stuff doesn’t require any taming, but you may need to put an extra sheet underneath it if there is any sort of pattern on the table you set the light box on, otherwise the pattern may show through the paper. I used a hole puncher to create the holes to hang the paper. It was a challenge to find larger boards for larger light boxes, but I finally did find some at the Evergreen State College bookstore in the art supplies section. That’s the red background in some of the previous photos. The other side of the board is white, so it’s like getting two backgrounds in one! Due to the size, I used 4 screws for this size box. Those boards are super stiff, so in order to keep them in place for photography I have to use weights. 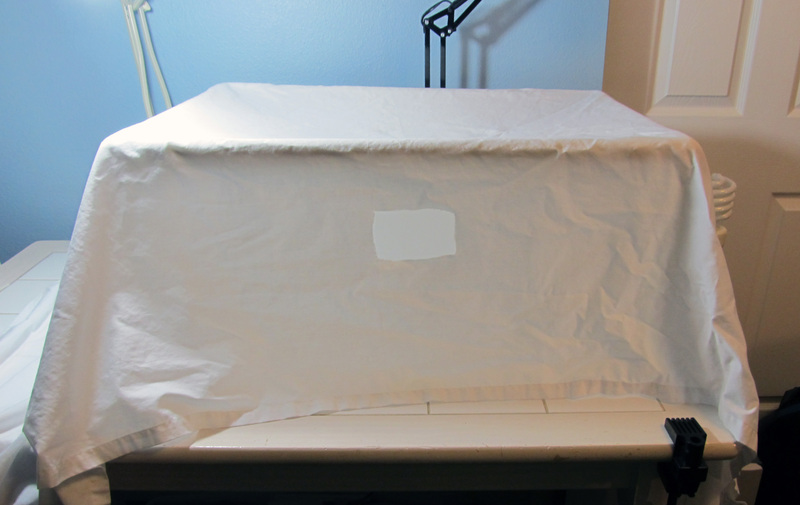 To cover the light box and diffuse light I looked for the whitest sheet I could find. I got a Full, but I think I would have been fine with a Twin. 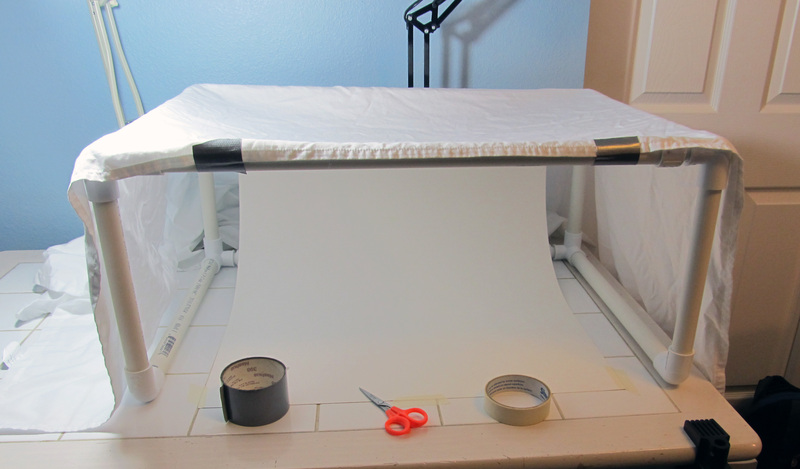 For open-front photography (usually that’s how I photograph projects), I use some duct tape to secure the edge of the sheet to the top of the frame. 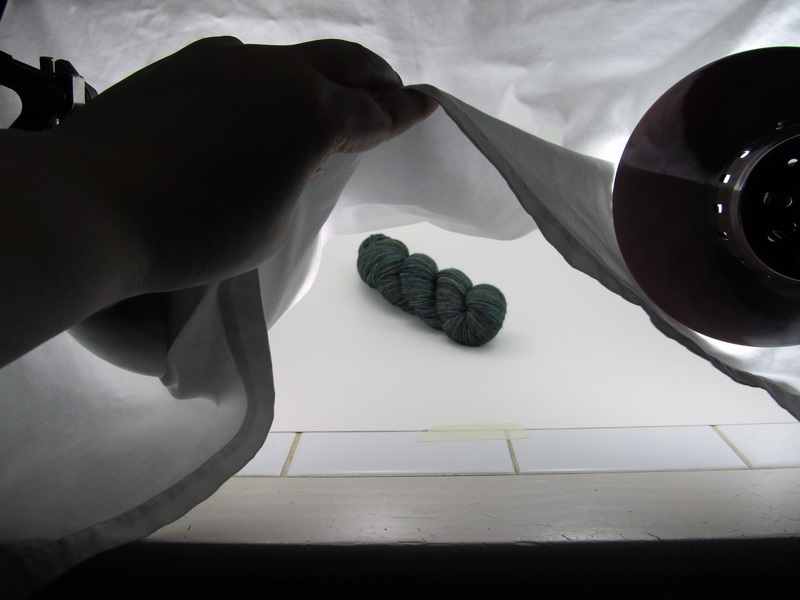 Sometimes I prefer to have a light source (or two) in front of the box, so I cut a hole in the sheet to shove my camera through – this is how I do most of my yarn photography. I don’t use any tape to secure the sheet with this set-up because I tend to shift the sheet around a lot to capture different angles. 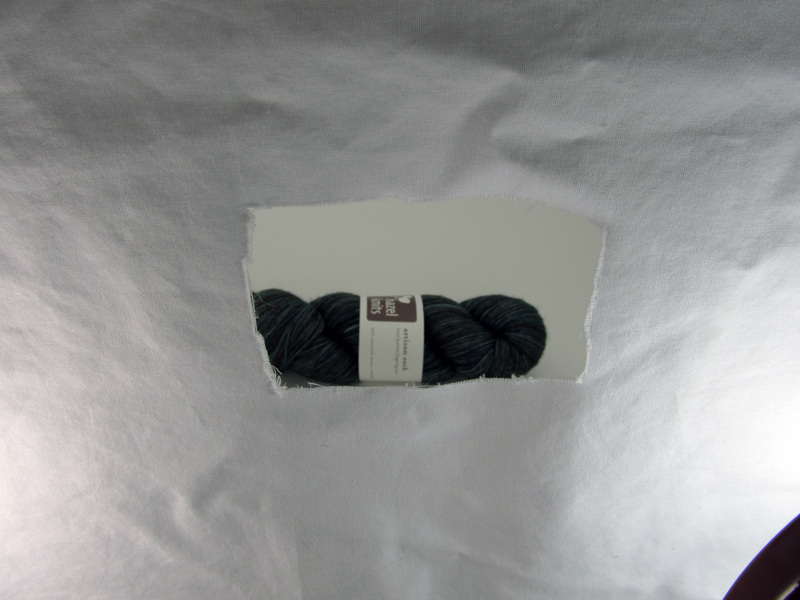 You may want to use fray-check on the edges of the cut hole to keep the fraying down to a minimum. I haven’t done that yet, but it’s on my to-do list. I had a few lights on hand, but I always seemed to want more light, so I ended up buying more lamps. I got the architect style (fancy talk for lights that clamp to things) lamps at Fred Meyer for about $20 each. I have 6 lamps total (one is not clamping), but your needs may vary. I’d start with 3 and work up from there if you need to. For the bulbs, one of my main concerns is that they don’t get too hot, because the last thing I need happening in a room full of yarn is a fire. 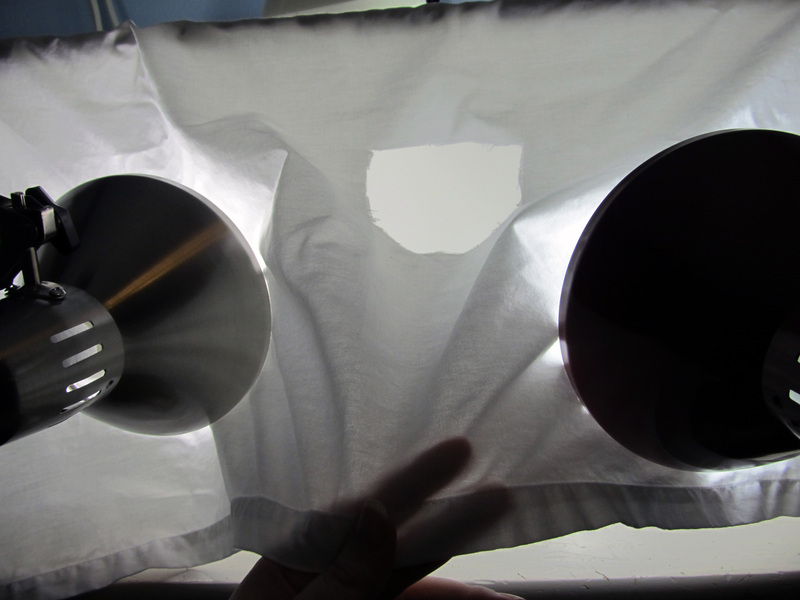 As you can see from the photo, I keep the lights RIGHT next to the sheet for the brightest light possible. I use the spiral kind of bulbs – I have yet to find one of those that would get hot enough to set things on fire. 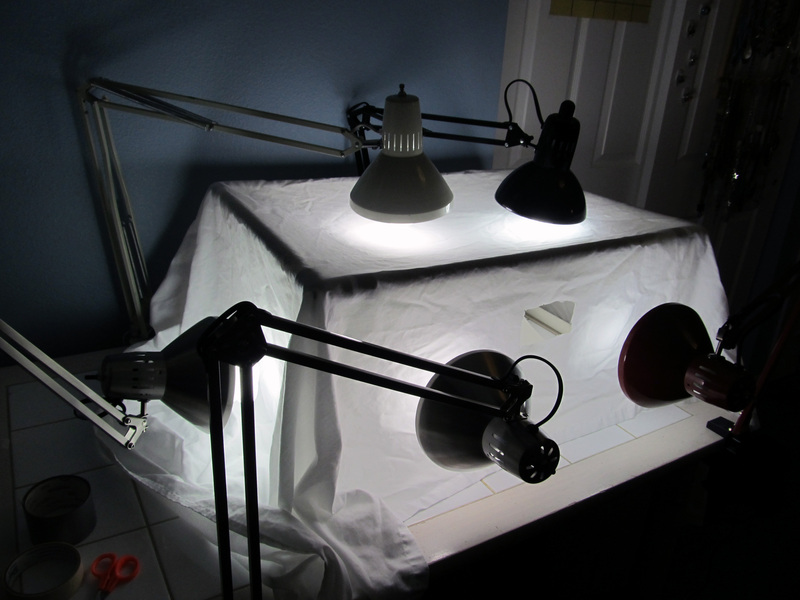 Even so, I never leave my light box unattended when the lights are on and even after I turn them off I move them away from the sheet to cool down. Try to get the whitest and brightest bulbs possible. Mine are Satco Hi-Pro Spiral 32W bulbs. I frequently hold the camera in one hand and hold the sheet at an angle with the other hand to get some good unobstructed shots. For low angle shots I usually just lift the edge of the sheet up. Here’s an example of what the finished photo would look like (unedited because I haven’t figured out how to edit photos on this computer yet). What are your tips and tricks for making or using light boxes? 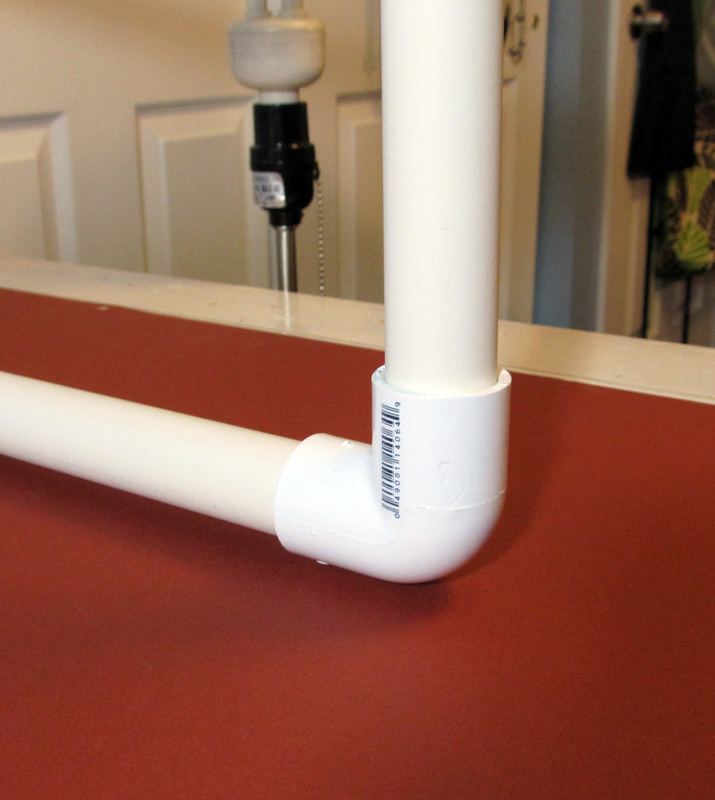 This entry was posted in photography, yarn and tagged Fred Meyer, Home Depot, Lightbox, Photography, PVC, pvc pipe, pvc pipes by yarnologist. Bookmark the permalink. I’d love one of these- as soon as my DS moves out and creates a little space!